BERLIN/PARIS, Feb 12 2019 (IPS) - A documentary about a Cuban family facing an uncertain future had its world premiere Feb. 12 at the Berlin International Film Festival, one of the world’s most prestigious cinema events. “La Arrancada” (On the starting line) is a debut feature by Brazilian director Aldemar Matias, focusing on a young athlete who is having doubts about her role in national sports in the Caribbean country. The narrative follows her as she considers her future, which may well lie abroad, she reluctantly realises. Structured with sensitivity and shot in an understated style, the film eschews the usual visual clichés associated with Cuba. Instead, with nary a Cadillac in sight, it offers a story with a strong feminist sensibility, told as it is from the point of the view of the athlete, Jenniffer, and her mother Marbelis. The latter is a no-nonsense boss of a fumigation centre in downtown Havana who marshals her army of mostly male fumigators to destroy mosquito nests throughout the city. Away from work, she tries to ensure that her daughter and son fulfil their potential. The mother-daughter relationship is at the core of the film, with some poignant scenes, but “La Arrancada” also addresses the role of young men who feel they have to quit their homeland to improve their lives. We see Jenniffer’s brother getting ready to leave Cuba, and travelling through several Latin American countries, even as Jenniffer struggles to find her own role at home in the competitive arena. This intimate account of a family in the “Global South” explores issues of emigration and youth unemployment and “unfolds the portrait of a generation unsure of what’s next in Cuba”, as director Matias says. 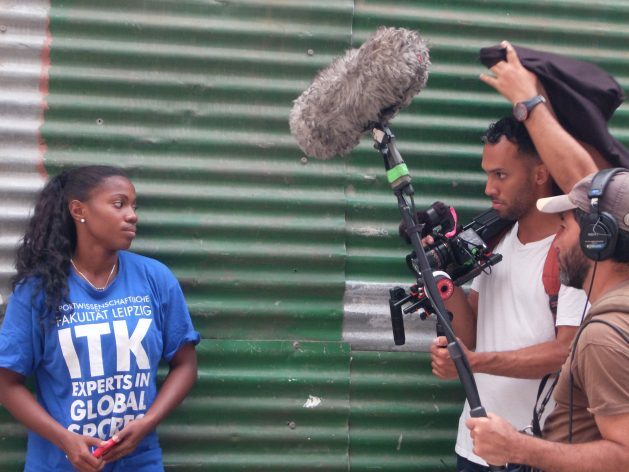 In the following interview, Matias – who studied in Cuba – discusses his background and the themes in his film (a Cuba-Brazil-France co-production, distributed by Miami-São Paulo company FiGa Films). Q: Before we discuss the film, can you tell us about your background, where you were born and how you came to study in Cuba? Aldemar Matias (AM): I was born in Manaus, Brazil. In my early twenties, I started working there as a TV reporter for local TV channels. It was always TV shows about arts or environmental subjects. Then I had the desire to spend more time with the people I was interviewing, to have the possibility to develop a deeper relationship with the characters. That’s when the interest for documentaries appeared. At that moment I already knew about the school in Cuba. It seemed like a holy land for aspiring filmmakers, specially from Latin America, Asia and Africa. Actually, the institution was initially thought to give high quality film education for these “3 worlds”. For me, It was a life-changing experience. It’s still my favourite place in the world. Q: What sparked the idea for La Arrancada? AM: I already knew Marbelis (Jenniffer’s mom) from a previous short film I did, El Enemigo. Then, I was in Cuba trying to do another project, with multiple characters, that was not working very well. I called Marbelis to be part of it and to film a day at the beach. Her daughter asked if she could join in. When I saw these two interacting, that’s when I really saw the possibility of a powerful story, and I decided to focus completely on them. Q: The film could have been set in many other countries in the Global South, with its themes of young people leaving their homeland in search of better opportunities, parents living with the sadness of distance, national uncertainty about the future, etc. Could you discuss your reasons for highlighting these concerns? AM: I believe the intimacy of a family is a great place to portray bigger political contexts. When we see the lives of these two, we can understand better how complex it is to make these decisions, to deal with these uncertainties. Jenniffer might have the idea that she can reach better opportunities somewhere else, but at the same time, she cares about what she’s doing in Cuba, I mean, she’s very upset when she can’t compete. Marbelis might reproduce a nationalist speech in the morning for her workers, but at the same time she can help her son to leave the country. How do we know what’s the best life project for us and our kids? When we see particular family stories up closer, immigrants (from Cuba or from anywhere else) become more than just a number or statistics. It’s not as reductionist as “there is good, here is bad”. Q: La Arrancada may be considered a feminist film, even if this aspect isn’t over-emphasised. Many viewers will appreciate the comments from Marbelis, the mother, to her son in one memorable scene, where she cautions him about the misogynistic lyrics in certain types of music. Can you tell us more about this section and why you included it? AM: I think about Marbelis’ feminism the whole time! Not just this scene. But it’s not up to me to judge it. As a filmmaker, and especially as a male filmmaker. I love the fact that it just comes naturally: she might know nothing about concepts such as sorority or empowerment. But she’s there leading a troop of men every morning in the health district with “audacity and discipline”, as she says, alongside with her sister Delaires. At the same time, she might make a joke with Jenniffer saying “she won’t get married if she doesn’t prepare the lunch fast”. The patriarchy culture is there as well, obviously. That’s her authentic personality and I have to be honest with its complexity. The same way she might call out her son for misogynistic lyrics, and then she can dance to it later. Q: The story is told in a very understated way, leaving viewers to draw their own conclusions, especially concerning the role of women in “male” domains. Why did you choose this approach? AM: I believe my job as a filmmaker is to open discussions, not to give conclusions. And to make the viewer empathise with complex realities and personalities. That’s why I choose to film in this way. But of course, I also need to take responsibility of the journey the viewer is taking and to provide the right path to generate the questions I want him/her to think about. Q: The English title is “On the starting line” but “arrancada” could also be “torn” which accurately sums up Jenniffer’s situation. How did you choose the title? AM: This great idea is from the editor, Jeanne Oberson. I believe the title must provoke a question at the end of the film. “La Arrancada” has the obvious superficial first layer/meaning connected to Jenniffer’s sports activity that you see immediately in the beginning of the film. But then you think about the title again in the end and you actually might question yourself where is this “arrancada” taking her? Will she be able to be “arrancada”? How is this “arrancada” going to be? At least, that’s what we intended to provoke. Q: This is a Brazil-Cuban-French co-production. Can you tell us about the production aspects? AM: The production company is Dublin Films, from Bordeaux. The film was actually financed and post-produced in France, all shot in Cuba (with a Cuban crew) and directed by me, Brazilian. AM: Right now I’m in the post-production of a short film I did in my city, Manaus, and a 5-episode TV series about young dancers in Peru, Colombia, Bolivia, Ecuador and Brazil who challenge the conservatism of their communities. Although I’m based in Barcelona, I want to keep researching new stories in Latin America, especially in the Amazon, the region where I’m from. By the way, the political moment we’re living in Brazil now urges new stories to be filmed.